Looking for some easy advice to ensure your pup thrives? Pets Training & Boarding take a look at the basic requirements all puppies need to grow into a well-rounded and happy dog. There is nothing quite as wonderful as inviting a wee-puppy into your home. But amongst all the love and endless kisses, what does your puppy need to thrive and grow into a happy dog? Firstly; your pup needs a good diet to guarantee their growth and health. Many commercially available foods are now considered ‘complete’ diets, meaning that you do not need to add supplements in order for the food to be completely balanced. Always speak to your vet or breeder in regard to the best food to feed your new bundle of fur. If you are considering changing your pup’s diet do this very gradually to avoid tummy upsets. A sudden change can cause diarrhoea and a very sad pup. Only feed your puppy specially formulated food for their age group. Puppy food contains much more needed minerals and vitamins to ensure good bone growth. As your pup grows their nutritional requirements will also change. Always follow the manufactures advice for feeding guidelines on amounts to feed and age. If you are concerned about your pup’s growth seek veterinary advice. If you are considering any ‘special diet’ for your dog, please ask your veterinarian for advice. If your puppy does not get the correct amount of nourishing nutrients during their growth stage it can put them at risk of developmental complications. Home-diets need to be strictly regulated to ensure your pup gets everything they need. 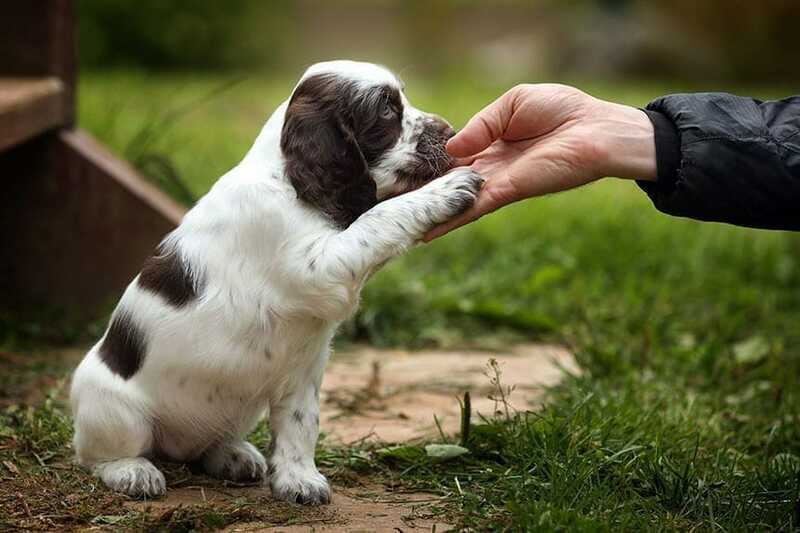 All pups need a good dose of training to ensure they grow into happy and well-mannered dogs. The great news is that you can start this the second your pup arrives home. However, it’s also important to get a clear understanding of what household rules you expect of your puppy and to implement them from day one. Remembering, what might be very sweet in a little snuggly pup, may not be so cute in a 45kg dog. Keep these rules on the fridge and ensure every household member stick to the boundaries. Will Rover be allowed on the couch? Will Rover be allowed on beds? Will Rover be allowed in the kitchen? It’s also a good plan to think about safety. Ensuring that you teach your pup/dog to ‘wait’ at the door before you step through, or on the stairs, can save you or a child a nasty fall. Not allowing Rover in the kitchen can also keep your pup safe from accidents that could see them hurt – cue the boiling cup of tea. …And even a cue word to eat and go wees.WHY? If you train your pup to wee on command it makes car-rides and bed time easy. A cue word to eat can begin your puppy to learn not to take food from strangers or eat anything unless you say it’s OK. This is why training is so important – it not only gets you and your dog speaking the same language, it also can keep your precious dog safe. Puppy Socialisation is a very very important aspect of puppy ownership that goes unnoticed until it’s too late. Many times, owners are so busy trying to keep their pups safe during the ‘unvaccinated’ stage that they forget to socialise their pups. This can lead to grown dogs that are simply terrified of everything, or worst still, shows signs of aggression towards certain stimuli. So, how can you safely socialise your pup during the unvaccinated stage? It’s time to get creative! Have lots of visitors of all shapes, sizes and ages (don’t forget lots and lots of children), and book in with a puppy-preschool so your pup can play with other pups. Interestingly enough puppies learn better from other pups rather than older dogs. So, puppy-preschool is a wonderful and safe way to socialise your puppy. Also take your pup with you as much as you can. Go watch the traffic, head into the school to pick the kids up. Lots of loud noises. Think as many sights, sounds and experiences as humanly possible in the early weeks.